Kongsberg Maritime said it has been awarded an Engineering, Procurement, Construction and Installation (EPCI) contract with Flensburger Schiffbau-Gesellschaft (FSG), a subsidiary of Siem Group. This is the second RoPax contract that Kongsberg Maritime has been awarded at FSG. The ‘Full Picture’ contract, valued at approximately €20 million ($23 million), covers engineering, procurement and project management, maritime technology deliveries and installation on a LNG fuelled RoPax Ferry for French company Brittany Ferries Ltd. The integrated project will be executed by Kongsberg Maritime’s Solutions department. 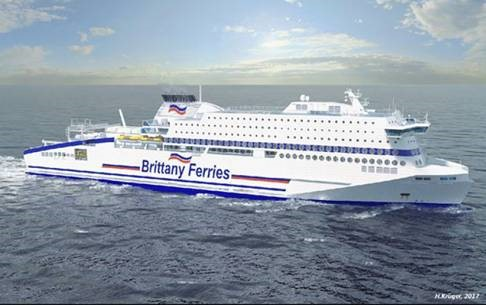 The 42,400 gross tonnage LNG RoPax ferry, which will be named Honfleur, will have an overall length of 187.4 m and a 31 m beam, with a cargo capacity of 2,200 lane meters, and an additional dedicated car deck for 300 cars. It will be equipped with 255 passenger cabins and several restaurants, bars and lounges on two decks, with a total capacity of 1,800 passengers and crew. Kongsberg Maritime’s project delivery and automation and control technology will support the vessel’s design to enable optimal fuel consumption, while meeting current and known future environmental regulations. The contract includes supply and integration of the LNG Fuel Gas Supply System (FGSS), electrical, telecom and integrated control systems, project management, interface management and engineering services at all stages. Cables, installation and installation materials for the above systems are also included. In addition, a significant technology scope of supply includes shaft generators, switchboards, automation systems, Emergency Shut Down system (ESD), rudder control, navigation systems, radio/satellite external and internal communication systems, as well as entertainment and information systems. The engineering and construction phase is estimated to take two years.